This is a car GM, Chevrolet and anyone who loves American performance machines should be supremely proud of. It has set the bar very high for the competition. 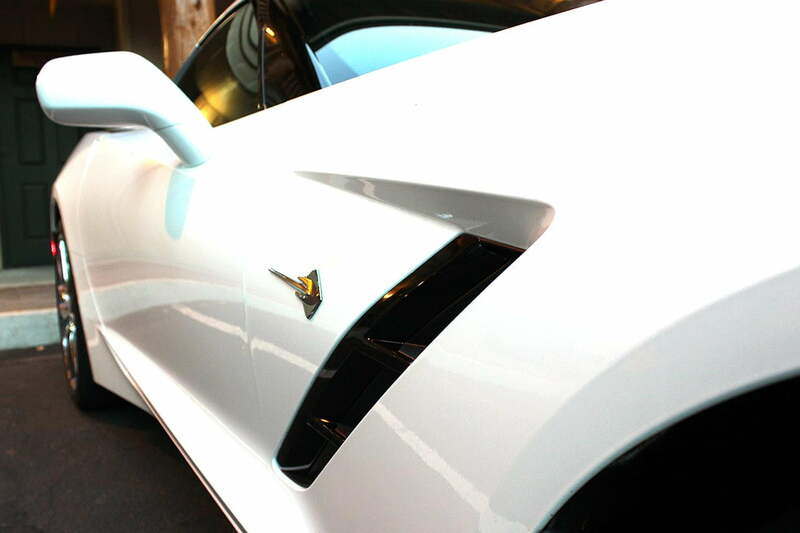 Fine, sue me in cliche court, I don’t care: driving the 2014 Corvette Stingray was something I’ll never forget. The new Stingray, known in series parlance as the C7, is a fantastic sports car and Chevrolet is to be commended for their accomplishment. Although too brief, my seat time in Chevy’s newest iteration of the iconic sports machine was telling as I powered the Z51 Performance-equipped Stingray down some of Oregon’s most scenic and lightly patrolled back roads near the center of the state. I’ll let you do the math. Curling around the sweeping turns on the high-desert roads, I had to remind myself to quit tapping the brakes going into turns at speed because I was nowhere near the handling capabilities of the car. “Drive it like it’s designed to be driven,” Shad Balch with GM, who was in the passenger seat for the press drive, told me. And when I did, the reward was pancake-flat tracking at license-suspending velocities as the Corvette begged to be lit up early on corner exits. I was always happy to oblige. I can’t say enough good things about this transmission. With 460 horsepower and 456 pound-feet of torque on tap from the 6.2-liter small-block V8 and routed through a six-speed dual clutch transmission, the base car rockets to 60mph in 3.8 seconds and I’m here to tell you, they aren’t fudging the numbers. 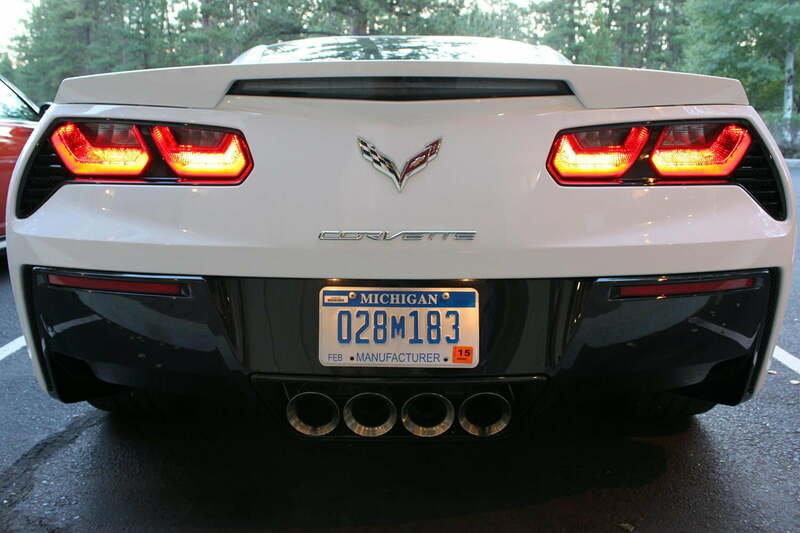 While the C7 I drove featured the Z-51 handling package and the LT3 Preferred Equipment group, bringing the price tag to about 72 large, the Z-51 package mainly boosts handling prowess while exhaust system changes tack on 5hp and 5 pounds of torque to the engine output. On the empty roads of Central Oregon, you can stop right in your lane and have lunch before another vehicle comes along. So after coming to a stop and clicking the drive selector to sport mode, stuffing the gas pedal brought out the best of the automatic transmission as it stepped through the gears close to redline, shifting so fast and so precisely that any caveats of automatic vs. manual simply disappeared for me. The smoothness was a revelation. There’s no way I could match that kind of precision with a clutch and lever. No one can. Carmakers say manual transmissions are disappearing due to a lack of demand and trannies this precise are a good reason why that will continue to happen. When I wanted to take over shifting duties, wheel-mounted paddles were at the ready and on downshifts, the engine blips to match rpms, maintaining handling composure. I can’t say enough good things about this transmission. The refinement and intelligence of it, as well as the ability to use it manually with no nanny upshifts at redline, was something I have yet to experience in any other performance car. And dear God, the sound of the thing is just nuts – and adjustable, sort of, using a two-mode exhaust sound selector. But no matter which mode you choose, romp the throttle and the ‘Vette fills with the roar of the V8. Paddle it in town and it burbles along, mannered but menacing. Blasting along, I expected the Stingray to shimmie and shake the way past flexible-flyer Corvettes behaved. They seemed to specialize in going fast in a straight line while cornering left you looking through performance catalogs for immediate upgrades. No more. Set to Tour mode on the less-than-silky-smooth country roads, the Stingray transmitted road information with a soft edge free of banging, bouncing or spine-compacting hits on bumps. Dial up Sport mode and the changes are subtle but effective: the suspension and steering clearly tightens up, but the magnetic ride control system, which parses suspension data in milliseconds, keeps the Corvette from becoming an unbearable track car lost on an open road. And in case you do get the Stingray out on a smooth closed course (and you absolutely should given any chance), Track mode takes the settings up another level so you can give those Porsches fits. 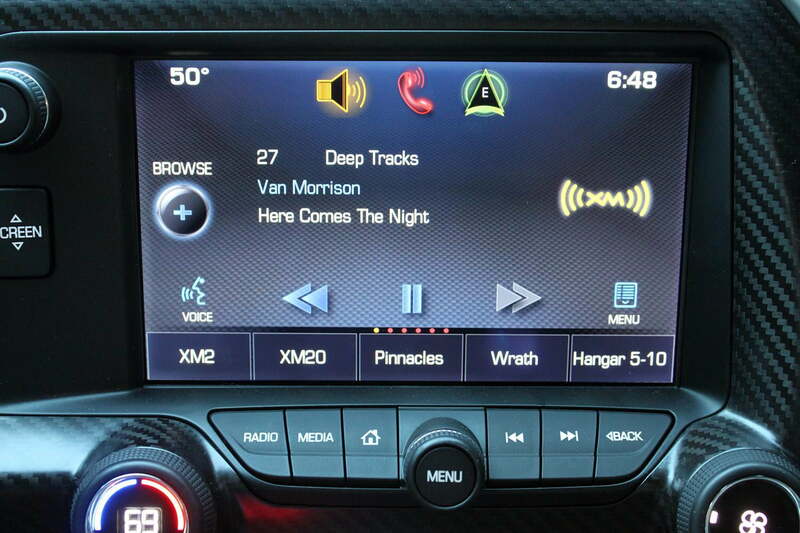 Inside, Chevrolet has gone to great lengths to make the tech in the car both useable and accessible. It has all the usual things you expect: navigation, HD radio, Pandora, phone ops and more through MyLink. Bose handles the audio duties. But there are so many cool tech touches: there are no door latches, just a small, well-placed button on the inside armrest and another hidden inside a lip of metal on the outside of the car. It sounds overkill but in practice and design, it makes good sense in terms of function and security. I never fumbled with it, it seemed second-nature from the first use and that kind of simple operability pervades the car. The car just has smart written all over it. Another nice touch: the large central display slides down to reveal a hidden cubby hole that features a USB port and is also lit from inside. It’s the perfect spot to store, connect and charge your phone while keeping it out of your sight while driving. Also, it can be locked via the key fob to keep away prying valets or anyone else. 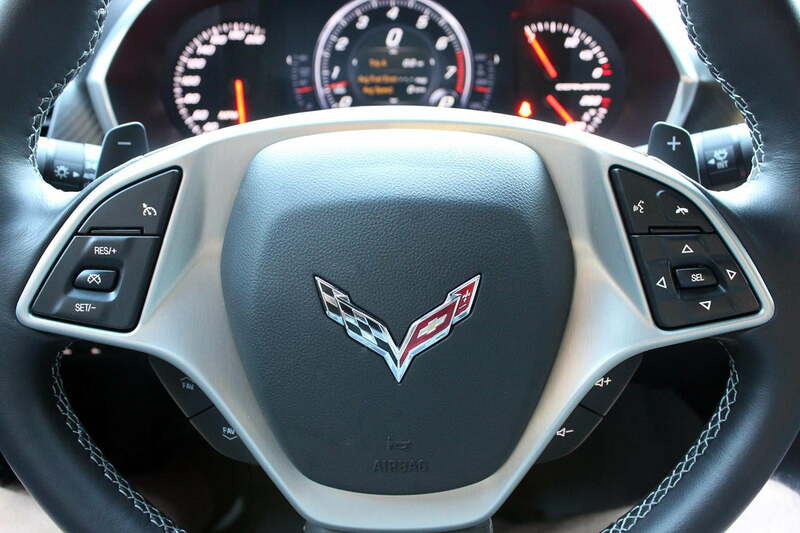 Peering through the steering wheel, the Corvette combines analog gauges left and right with a center LCD screen featuring a large color and appearance-matched tach. It’s hard to tell the LCD clock from the physical gauges. The display is also configurable and changes for different drive modes. Climate controls are under the main central LCD screen but passengers are able to control their comfort with a second small panel near the passenger window. The car just has smart written all over it. 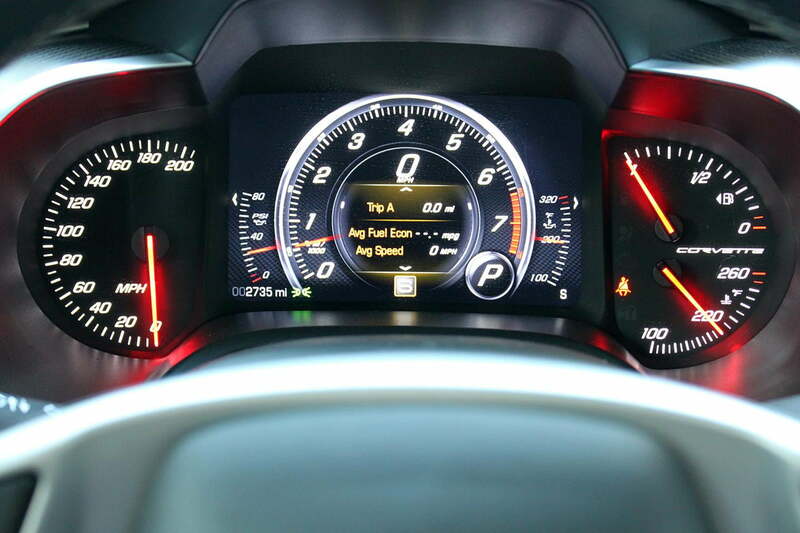 Under way, the optional color heads up display (HUD) in the windshield displays speed, RPM, drive mode, G-force meter (definitely needed) and simple navigation instructions. Attention car companies: want to solve a large portion of driver distraction? 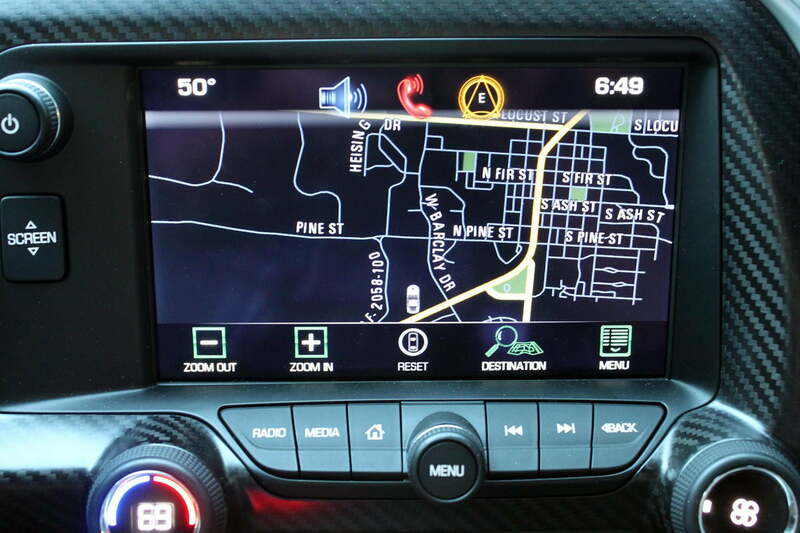 Then put a HUD in every car and minimize the central dash display. The technology is cheap and proven. There’s a reason it’s in fighter planes, it keeps the pilots focused and informed at the same time. Same result here. 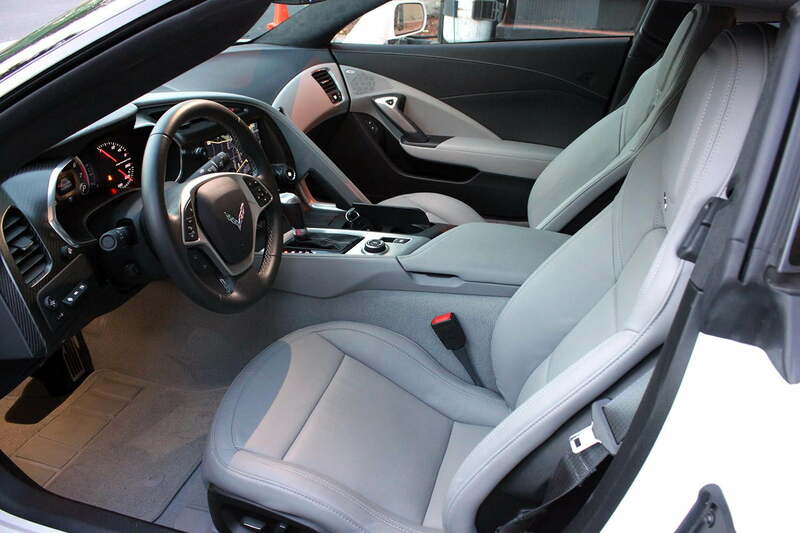 Another revelation: This is a really comfortable Corvette. Standing over it, I braced for the calisthenics of getting in but sliding my 6-foot 1-inch, 230-pound carcass into the driver’s seat was challenge-free. Getting out was easy as well and required a minimum of grants and joint snaps. Once underway, the seat, while very supportive, gave true long-term comfort, which can be tweaked with bolster and lumbar adjustments. The pedals fell to my feet just right and the cockpit, for a sporting machine, was downright roomy. Vision around the car was on par with many sporty sedans save the b-pillars, but even that wasn’t so bad due to the small rear windows and arching glass rear hatch. A rear-view camera helps out there as well. And there’s certainly enough room for two rollie cases and more in the back. A practical Corvette? It’s no minivan but the comfort, space and general feel of relaxation while driving it at less than extra-legal speeds are a departure from the masochistic confines of many competitors. Finally, there’s the look. My test car came in Arctic White (can I just call it Speed Racer White already?) and it is the best-looking Corvette of the modern age. Much has been made of the not-round taillights and I have words for the purists: forget it. They would not work on this car. “It’s got Camaro taillights” is the most common refrain. Yeah, so what? They look great. The rear end of the car, especially when it’s sporting those 20-inch chrome “Corvette” signature wheels, is perfectly pulled together. Everywhere we drove, onlookers snapped away with cell phones and cameras. . 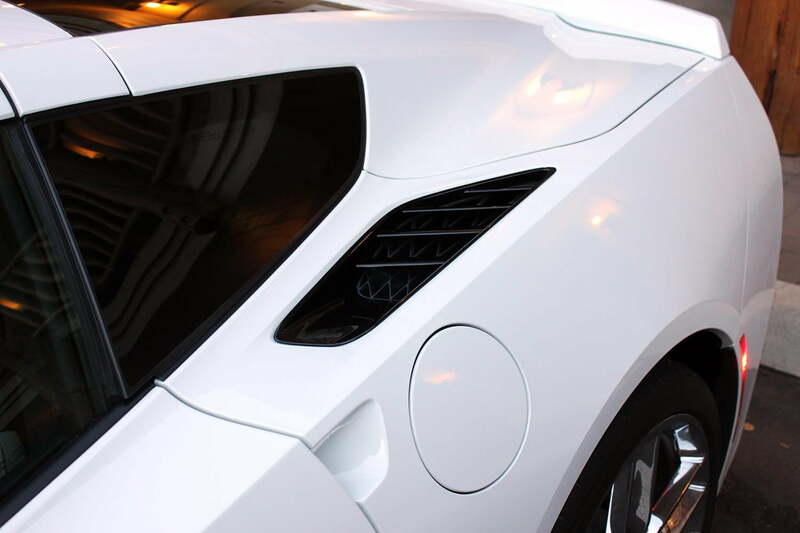 The quad exhaust pipes with their interior detail, the perfect bezel space between the taillights and the spoiler and the plunging side skirts all speak to the power and precision of the car. And that’s to say nothing of the striking front end fender flares, side strakes and air vents in the hood and behind the doors. 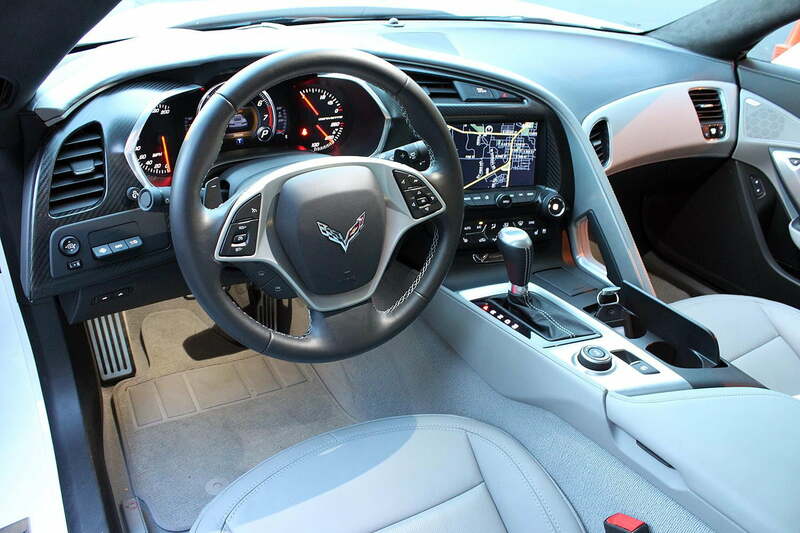 It combines the best of traditional Corvette styling cues while moving the car quickly into the modern age. Everywhere we drove, onlookers snapped away with cell phones and cameras. This is a Corvette that gets peoples attention.